Boring lecture? 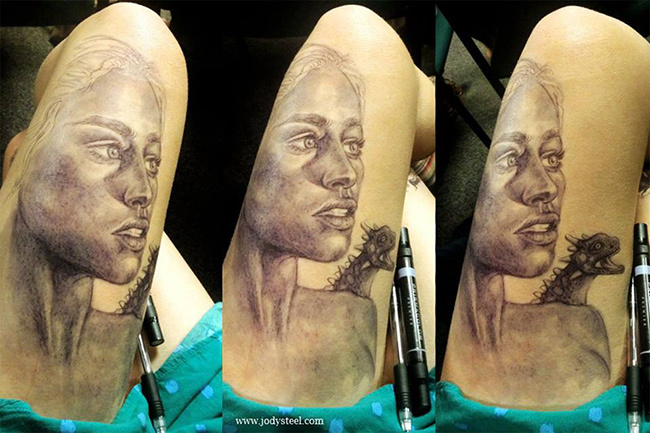 Many of us doodle in class, but artist Jody Steel, from Boston, America, eschews paper and uses her body as canvas instead. This talented college student hasn't gotten in trouble for doodling in class. In fact, she's being rewarded for it. Using pen she creates stunning temporary masterpieces, and now her doodles have given her internet fame and job offers from around the world. 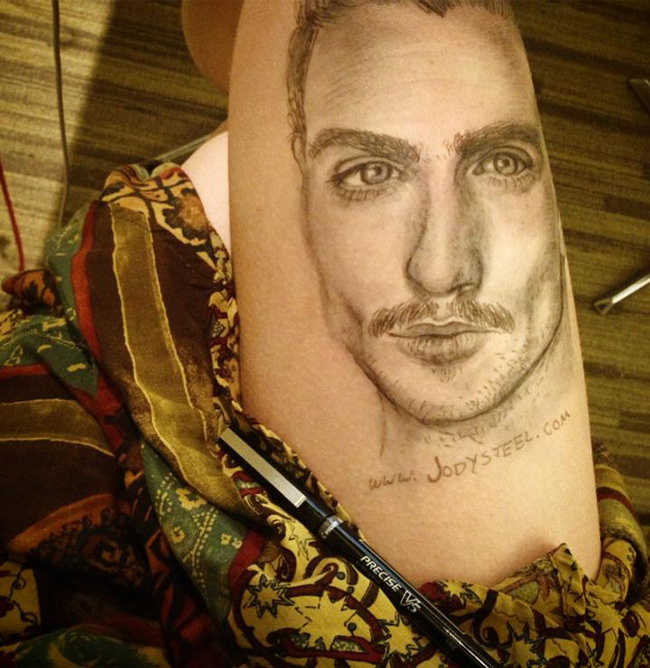 Are you an art student, or is this just a side hobby that you're insanely talented at? I am a Visual Media Arts Film Production major. I had applied and been accepted into several Fine Arts institutions, but decided to pursue my career in film. I intend to continue illustrating and painting, though. It's my absolute main passion in life. I'm self-taught, but I've been working on my craft for as long as I can remember. 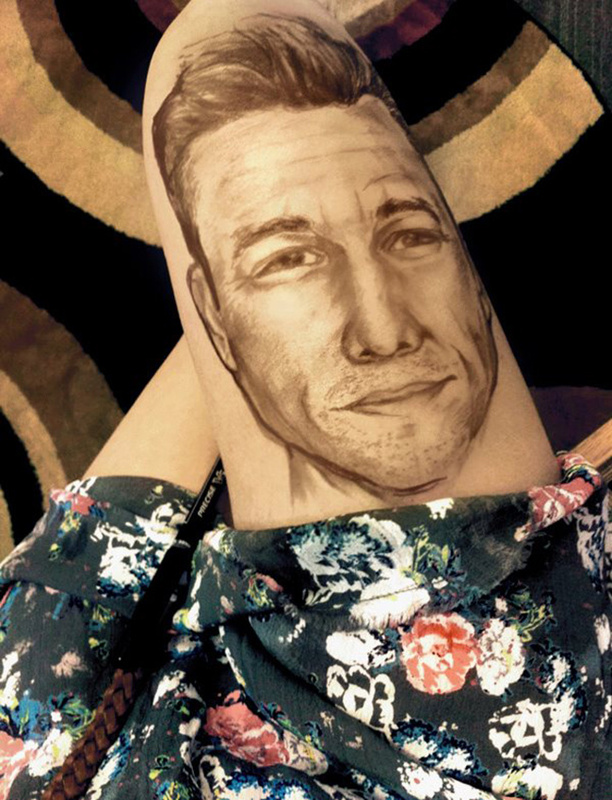 OK, so why did you start drawing on your leg? 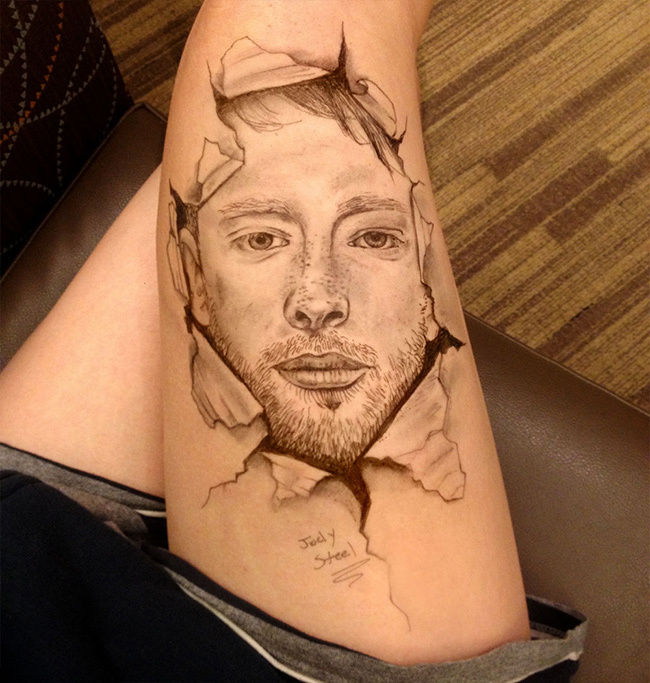 I began drawing on my legs during my classes and lectures. 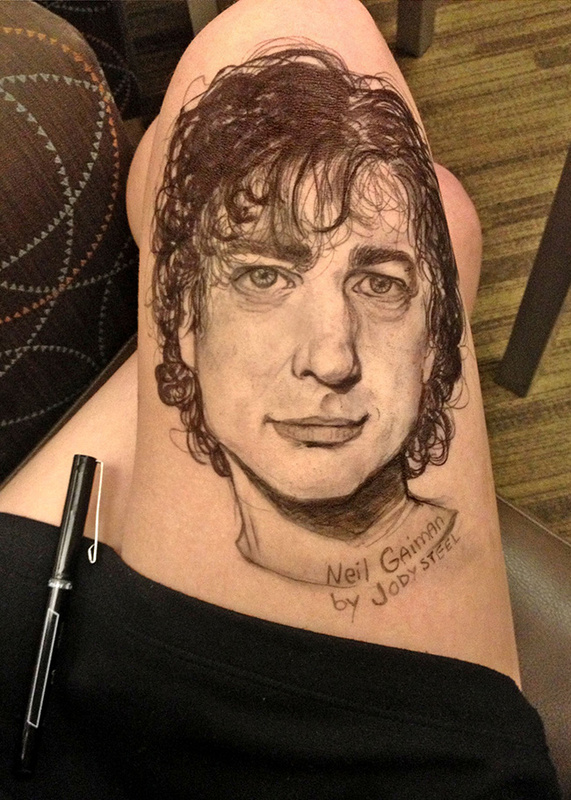 I've also drawn on notebook paper, but I found that drawing on my legs was both quicker and more efficient�not to mention my legs are just as pale as paper. It takes anywhere from 45 minutes to an hour to complete a drawing. Do you do all of your drawings while in class? I draw everywhere and at every time. I think that's what honestly compelled me to draw on myself. If I'm not drawing, I constantly have the urge to and I'm continuously inspired by what's around me. I hope to travel more than I already have. Museums are my favorite thing in the entire world. I cried when I saw the Mona Lisa. What was the first drawing that sort of launched you into internet stardom? Would we be right if we said the "Breaking Bad" one? The first drawing I completed was of Walter White. It went viral within the first day I uploaded it to the image hosting site, Imgur.com. It received most of its traffic from Reddit.com. Unfortunately, I hadn't put my name on it so I was [wasn't] credited. Since then, I began putting my website [URL] on the drawings and they've all managed to go viral through Tumblr, Reddit, 9Gag, etc. Smart move. Even though it hit Reddit, did the internet fame come unexpectedly? Since your drawings have received so much attention, have offers and requests for drawings been pouring in? It's gotten to the point where I can hardly keep up with the offers and requests. I want to reply to everyone, but I would need the entire day to do that. I've also been getting fan mail from around the globe. That's my favorite part. When someone says hello from Italy, France, Hong Kong, the UK, and beyond, I get so excited. My hands start shaking when I reply to some of them. The adrenaline has been non-stop. 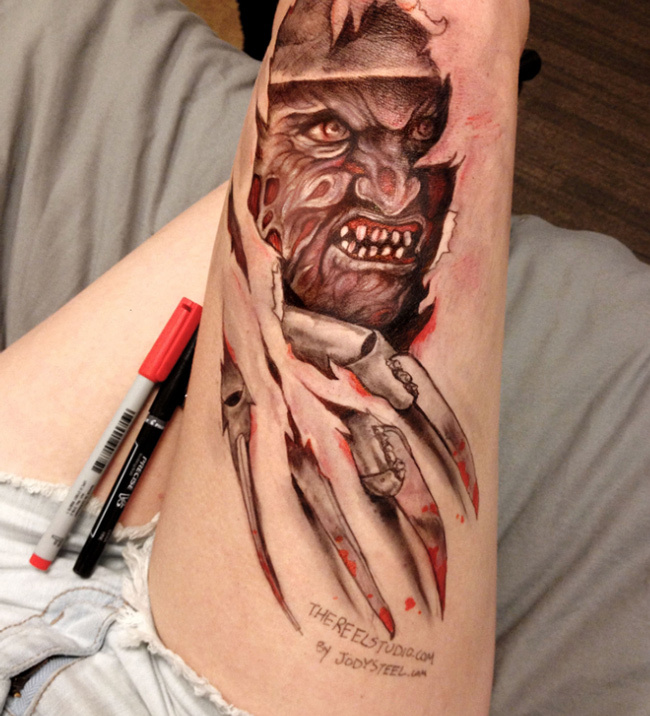 So, your leg artwork go you a job with a professor at Emerson. Maybe you can make a full-time gig out of it. That's the goal here. Freelancing is great, but it's not stable. I really want to work in the art department for film. If I can make a living off of that, then I can illustrate and paint on the side. I want to have my own gallery. Picasso, Dali, Escher � and then Steel. That's the goal. Ambitious. So what's the next move then? I don't know what my next move is, to be honest. I made a public [Facebook] page so I can connect with fans. I'm glad I've had my own personal website because that has helped, too. I'm still in school, so I haven't had much time to even think about it. It's getting hard to concentrate on my studies. I hope something will come of it professionally. If not, this is something that will stay with me for the rest of my life. OK, we need to know�since Bryan Cranston is in town, and "Breaking Bad" is on its final season, has Walter White or anyone from the cast seen your Heisenberg piece? If they have, I haven't been told. I don't think I'd be able to breathe if I heard that they have. 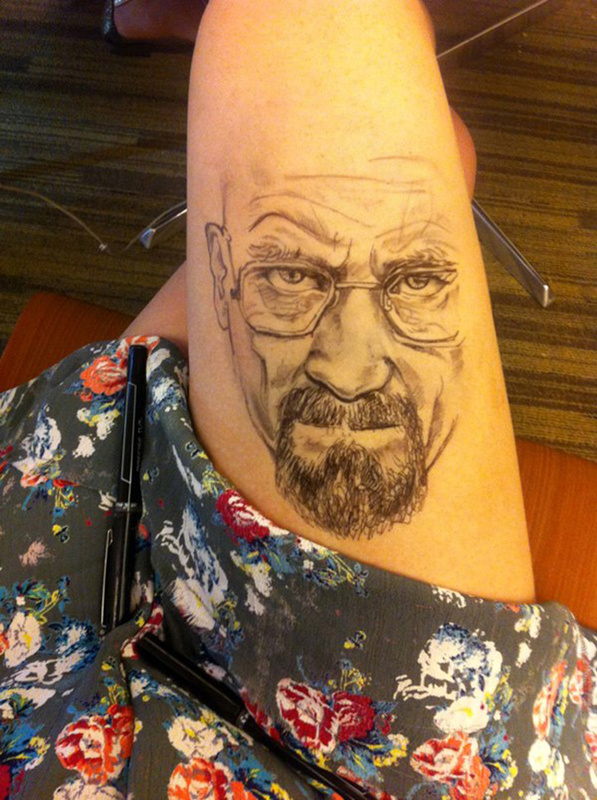 "Breaking Bad" is everything I would want to aspire to do in the industry. [Creator] Vince Gilligan is my idol. The cast is incredible. The production value is amazing.